This anthology of the year's best investigative business writing explores the secret dealings of an elite Wall Street society and uncovers the crimes and misadventures of the young founder of Silk Road, the wildly successful online illegal goods site known as the "eBay of vice." It reveals how the Fed dithered while the financial crisis unfolded and explains why the leaders of a two-trillion-dollar bond fund went to war with each other. Articles from the best newspapers and magazines in the country delve into how junk-food companies use science to get you to eat more and how Amazon dodges the tax man how J.Crew revitalized itself by transforming its creative process and Russell Brand went deep on media and marketing after his GQ Awards speech went haywire. 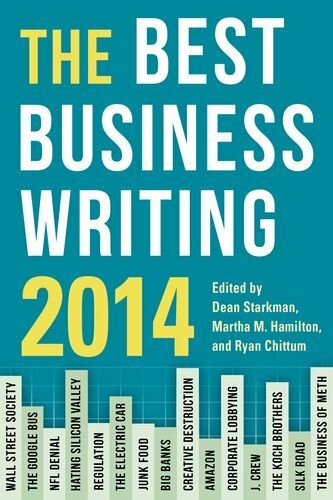 Best Business Writing 2014 includes provocative essays on the NFL's cover-ups and corporate welfare, Silicon Valley's ultralibertarian culture, and the feminist critique of Sheryl Sandberg's career-advice book for women, Lean-In. Stories about toast, T-shirt making, and the slow death of the funeral business show the best writers can find worthy tales in even the most mundane subjects.